Having young kids means you will hear endless stories about bullying and name calling when they arrive home from school and if you have more than one child, you will get to see this all first hand when they tease each other and compete for toys and attention. 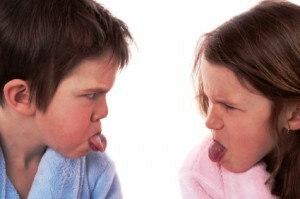 We teach our kids to not get upset when other kids say inconsiderate things to them. For instance my five year old daughter would regularly complain that a particular girl at her school was rude and would says things like”you are not my friend” which upsets my daughter (which is ironic since this is a teasing tactic that my daughters use between themselves at home). So we have explained to her to ignore people that aren’t nice and to not take it personally. Teaching our kids confidence and self esteem is a critical life skill. In life lots of “mud” gets slung your by people who are unhappy, angry, controlling, jealous or in some other hurtful mood and it usually has more to do with the “slinger” than the one receiving. When this happens, as it always does, we want our kids to be able to let it go. They get this. It is fun to see the kids learn important life lessons at such a young age. Posted on: July 27, 2010 Comments: 0 Comments - Leave a comment!